The Solemnity of the Epiphany of the Lord is the Christian observance that celebrates the public manifestation of the Jesus’ kingship to the world when the Magi visit and adore him. In the Gospel of Luke, an angel of the Lord reveals Jesus as “savior,” “Messiah,” and “Lord” to the shepherds when Jesus is born and laid in a manger (see Luke 2). But the visit of the Magi reveals another facet of Jesus’ destiny—his kingship. In Matthew, chapter two, the Magi announce to King Herod the purpose of their visit. Arriving in Jerusalem to seek the Messiah, they ask Herod, King of Judea, “Where is the newborn king of the Jews? We saw his star at its rising and have come to do him homage.” Departing Jerusalem and following the star’s movement, they find the child Jesus and his mother, Mary, in Bethlehem. Joyfully, they prostrate themselves before the King and present to the newborn King gifts of gold, frankincense, and myrrh. Through this prophetic event, the kingship of Jesus is revealed, while the gifts brought by the Magi prophecy the type of kingship Jesus would have. While tradition holds that the Magi were three kings or wise men, Scripture is silent on the number of kings who arrived to give homage to the Lord, as well as the background of the Magi (kings, astronomers, etc. ), and their names. 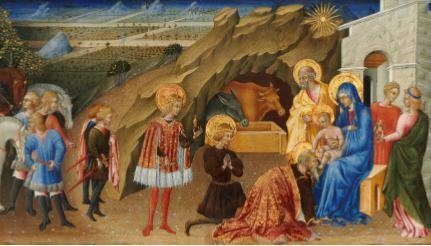 Nonetheless, while extensive details are absent in Sacred Scriptures, Christian tradition holds that there were three wise men, named Caspar, Melchior, and Balthasar. Current tradition in the United States often sees families using chalk to mark the top of a door post of their home with the initials of the three kings and the current Epiphany year. For example, for Epiphany 2017, a family would mark “20 + C + M + B + 17.” This chalking of the lintel is generally accompanied by a short ritual blessing of the house. It’s almost a cliché to say that for many people, the holiday season isn’t a happy one. Every year, there are newspaper stories about seasonal affective disorder, Christmas depression, and how to deal with holiday-induced stress. But what if our churches made an effort to reach out to people struggling and feeling out of synch with the traditionally festive Christmas spirit? Not through another “put Christ back in Christmas” campaign, as laudable as those efforts may be, but a real effort to help people heal. Perhaps churches could embrace the idea of a peaceful, reflective Christmas service. When I was the director of the Newman Center at Ohio State University, we hosted a more reflective Christmas Mass one Christmas Eve. The idea is simple: instead of the usual “joyful and triumphant” Mass with loud celebratory music, a reflective Christmas celebration features quieter, more serene music. The focus of the liturgy is on welcoming and acceptance, allowing people to bring with them whatever they’re feeling or whatever they’re grieving. In addition, the preaching and the prayers focus on the Incarnation of Christ and his coming into the world as a poor human child, to experience life as we experience it, with all its joys and sorrows. For people who are lonely, grieving a loss, or far from home, a calmer Christmas service allows them to feel at home in church, and accepted with all their struggles. In some places, churches host an early reflective Christmas service on December 21, the longest night of the year. We scheduled ours for Christmas Eve, believing that for people who struggle during the holidays, that’s the night when they feel most apart from everyone else’s sense of celebration. In fact, this type of Christmas celebration may be closer to the faith-filled but challenging experience that Mary and Joseph had on the very first Christmas night. 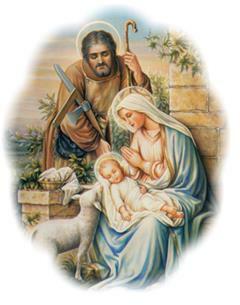 Mary and Joseph welcomed Jesus into the hardship of poverty, in the cold of winter, without proper shelter, away from friends and family, and with much uncertainty of the future—but what they did have was a simple and enduring trust in the provision of God and his goodness, in front of the mystery of the newborn son who lay before them. The infant Jesus, Emmanuel, God-with-us, is likewise perfectly at peace to come to us and dwell with each of us in the midst of our own difficulties. The newborn Emmanuel will come to us in the middle of our brokenness, suffering, loneliness, and loss. As he came to Mary and Joseph in their poverty, so too he will come to us in ours. This is the message of the reflective Christmas Mass. Over the years, I’ve had many people say that the reflective Christmas Mass was the first time they felt at home in church at Christmas time in many years. It’s a concrete way that faith communities can bring reconciliation and peace to the many folks who struggle at Christmas time. It highlights the spiritual significance of Christmas: that God is with us always, even and especially in the difficult parts. Fr. Larry Rice, CSP, serves as director of the University Catholic Center at the University of Texas–Austin.